Hotel Victoria, Prague. Victoria Hotel Prague. The Victoria Hotel is a newly opened three star facility found in the center of Prague near sights and attractions such as the famous Wenceslas Square, making it a convenient destination for those travelling for both business or leisure vacations. The 42 well designed, comfortable rooms offer a perfect solution for guests to enjoy a comfortable stay while enjoying their sightseeing around the city. The tram services is near by, making it easy to get to all areas of this historical European city. 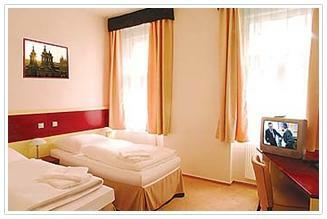 The rooms offer services such as Satellite TV, security lock system internet access and mini bar. The 24 hour reception is available to direct visitors to where they wish to go, or help with suggestions regarding the city and its various sights. Feel free to browse in the souvenir shop or change currency at the reception, that is always happy to help guests get whatever they need.